When the Ford School launched a bachelor's degree program in the fall of 2007, undergraduate programs were rare among public policy schools. 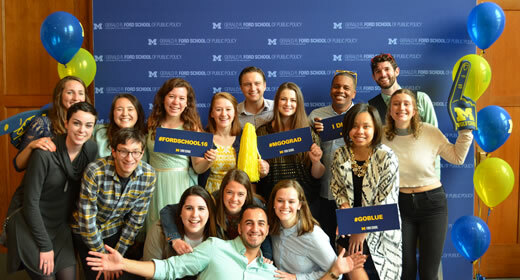 The Ford School itself had long housed a successful master's program for early- and mid-career professionals, but in creating a bachelor's degree, faculty hoped to provide University of Michigan undergraduate students with something different—an interdisciplinary, liberal arts foundation. And while this meant some level of experimentation in designing the program, the results, 10 years in, reflect the interdisciplinary ideals upon which the program was founded. "This diversity of outcomes represents a great success for a program that was designed to prepare students for a broad range of career paths," says Susan M. Collins, who began her tenure as dean when the first class of undergraduates began their studies at the Ford School. Joe Shea (BA '17), whose father Steve earned his master's degree at the Ford School in 1985, says he chose the program to improve his critical thinking and analytic skills, and has always thought of the training as a mechanism for addressing problems and, ultimately, making the world a better place. Nicole Auerbach (BA ‘11), a college basketball and football reporter for USA Today, takes notes while embedded with #1 pick Andrew Wiggins at the 2014 NBA draft. Joining in the fall of their junior year, undergraduate students like Shea come to the school deeply connected and engaged across campus, notes Collins, who continues to be impressed by the caliber of students the program attracts. The very first class of undergraduate students included the leaders of a dozen student organizations, the winner of a Hopwood writing award, the editor-in-chief of the Michigan Daily, and more. At the Ford School, these engaged students balance core courses with semester-long policy seminars—small interdisciplinary classes that allow them to learn about particular policy areas while honing their writing skills. Later, they work with faculty advisers to design their own "focus areas," by handpicking four courses across campus that will give them an opportunity to develop a deeper and more holistic understanding of a policy area that interests them. Natalie Relich (BA ’09), executive director of OHorizons, reviews water filter construction manual with members of Rotary’s Clean Water Ecuador Team. In addition to giving students a measure of control over their education, program director Sharon Maccini believes there's educational value in the process of sitting down and thinking about what you want to explore. "Good analysis is fundamentally interdisciplinary," Maccini says. "And so I think drawing from a range of disciplines is really important—not just for policymakers, but for anyone who wants to think about challenges and opportunities in a comprehensive way." Nicole Auerbach (BA '11), a college basketball and football reporter for USA Today, chose "women's health policy" for her focus area. Craig Kaplan (BA '15), a cybersecurity account executive at the for-profit Darktrace, focused on "American energy policy and its effects on economics, national security, and international affairs." Natalie Relich (BA '09), executive director of the non-profit OHorizons, focused on "environmental policy and sustainable development." Matthew Mejía (BA ’12), a policy and research associate at the Harlem Children’s Zone, at Marcus Garvey Park. Many students pursue these interests beyond graduation, and beyond the classroom. Matthew Mejía (BA '12), now a policy and research associate at the Harlem Children's Zone, focused on "education policy" and helped to organize the school's first student-run diversity summit. It is this type of thinking that the Ford School's undergraduate program seeks to foster in students, along with a willingness to act on their beliefs, and to follow through on lessons they've learned along the way. But there is one other element to the bachelor's program that is not so easily captured with anecdotes and statistics. Sitting in her office on the Ford School's main floor, Director of Student and Academic Services Susan Guindi was asked what, if anything, an article on the program shouldn't miss. The answer, she said, was what the undergraduate presence brings to the school. "Our undergraduate students bring idealism and energy to the program," Guindi said. "Their enthusiasm for the school and their studies is infectious." Rusty Hills, who has taught scores of undergraduate alumni over the years, couldn't agree more. "The students bring an enthusiasm to the study of public service that is sorely needed," he says. Ten years into the bachelor's program, that energy is still on display—both inside Weill Hall and through the work the Ford School's undergraduate alumni are doing each day. After all, this was a program that started out with few models to copy. It only makes sense that its students and alumni continue to shape its direction.